I finally did it. I started my sourdough starter again. Now that the summer has passed and the garden has been put away for the winter, I thought it would be a good time to hone my sourdough skills. Recently, it’s become important to me to re-start this traditional, ancient technique. For almost two months now, I’ve been conscientiously watching what I’ve been eating. Mostly, as I’m working to lose my baby weight. If you’ve followed my blog for awhile, you’ll know that I don’t “diet.” Instead, when I have weight to lose, I look at the quantity of what I’m eating and exercise. I’m breastfeeding, so for me it’s even more important to continue eating nutrient dense foods including animal fats, vegetables, legumes, and good quality meats. I also don’t deprive myself of bread. It’s been the sustenance of life since the beginning of time. However, over these couple of months I’ve started to notice that maybe I do start to feel a bit bloated after eating bread throughout the day. Since watching my food intake, I’ve lost about 10 pounds of baby weight. I feel the greatest when I have a yogurt smoothie in the morning, a green salad with tuna or sardines for lunch, and then a normal dinner of my choosing. I have started to notice some bloating when I have toast in the morning, a sandwich mid-day, followed by some bread with dinner. Now, when I talk about bloating, I’m not talking about extreme discomfort. I just started to notice a bit. In the real food and health communities there’s always people talking about bread. Especially when it comes to the phytate bound to phosphorus in bran (whole wheat). If you’re not familiar with this topic, pretty much, the phytate in the bran acts as a chelator, a “claw”. It grasps the minerals such as phosphorous, iron, magnesium, and zinc, within the flour. Our digestive process in our bodies are not sufficient enough to cause it to release the nutrients. They then pass through us unused and can actually cause a depletion of these minerals within our body. In order to release these nutrients, break down the phytate, many people soak their flours with an acid medium before baking, sprout their grains (which has been proven un-effective), or, as the ancients did, make sourdough. This book is one of the best that I’ve read so far that touches on this subject. It goes into detail about ancient bread and the way it was made. It’s amazing to think that in our early civilization, people not only survived but thrived on bread. Why is it that today so many of us suffer from allergies, gluten intolerance, and other deficiencies from what was once the sustenance of life? Our bread is no longer the same. This book goes into great detail and research about the stark differences in how our bread was prepared traditionally to how it’s “produced” today. Even to the grain itself, it’s no longer grown the way God had intended for it to be. It’s been hybridized so much that it grows on shorter stalks, with more protein, and gluten. Differences that not only effect the nutrients in the grain itself but is obviously effecting our health as well. I was so moved by this book that I re-started my sourdough and made my first loaf of sourdough bread. As long as you have some sourdough starter, this is a super easy bread to make. You can find the recipe at my friend Therese’s blog from Artistta. I’m going to start tinkering with this recipe but for now, I’m excited to see how I start feeling as far as the bit of bloating I’ve been noticing. Beyond that though, I’m really happy that I’m able to provide my family with a completely nutrient dense bread they can thrive on. Before you can bake bread though, you need to make a starter. Here’s the good news – It’s super easy to make at home. 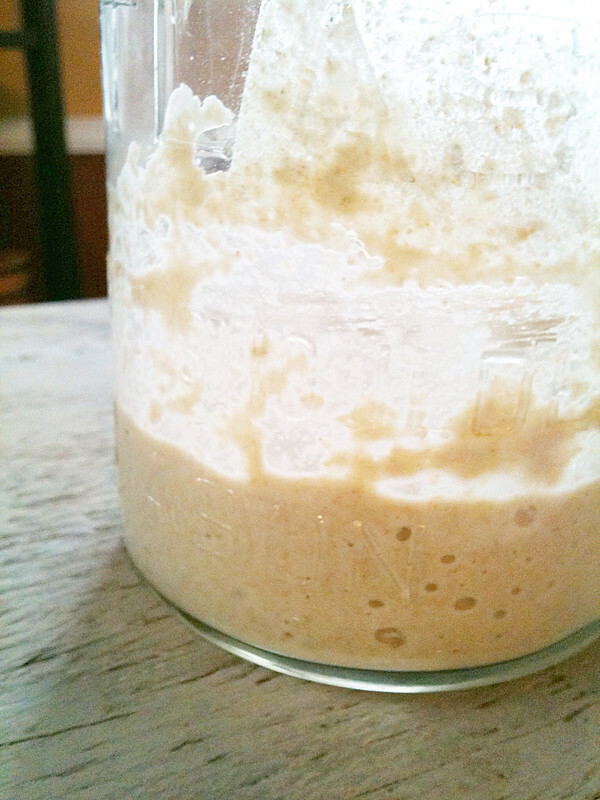 In order to make a strong sourdough starter that can raise a loaf of bread, you need to feed your starter twice a day. This can take anywhere from 2-3 weeks. Once your starter doubles in size after feeding it, you'll know it's strong enough to use. For my own sanity, I mark my mason jar after feeding it so that I can visually see if my starter has doubled. You can see this red line on the first picture of this post. In a pint sized mason jar, add 1/4 cup water and 3/8 cup whole wheat flour. Stir and cover the jar with cheesecloth or a coffee filter held down by using the ring of a mason jar lid. Place in a warm spot, 70 - 80F and allow to rest for 12 hours. After 12 hours has passed, stir the contents and throw away half of the mixture. To the mason jar, add another 3/8 cup whole wheat flour and 1/4 cup filtered water. Again, allow to rest for 12 hours. Repeat this process for two weeks. I feed my starter once in the morning and once in the evening before bed. Once your sourdough starter is strong and doubling in size, you can begin to build your starter to use for recipes. To build, add the contents of your pint sized mason jar to a quart sized mason jar. Add 1 cup whole wheat flour and 2/3 cup filtered water. Allow to rest for 12 hours. After 12 hours, throw away half of the contents and again, add 1 cup flour and 2/3 cup filtered water. Repeat this process for one week or until it doubles in size. There are many great sourdough recipes. I’ve made pancakes, crackers, cake, and bread. My favorite resource for all things sourdough is the GNOWFGLINS sourdough course. There you’ll find so much information, recipes, and a great community to help you along the way. Do you bake sourdough bread? Tell me, what are your thoughts on soaking, sprouting, or sourdough baking? I’d love to hear if they’ve made a difference in your families health. In Spain, many people do something similar using beer. It is much more quickly. You need only one night for fermentation. The name is ‘orly’ . It is not for bread!, but for coating in butter. It is great for shrimps! Silvia, this sounds wonderful! I’ll have to look that up! I was planing on taking my starter out of the fridge today! 🙂 I’ll look up your friend’s recipe. I’ve made Therese’s sourdough a couple times, but both times came out flat and doughy in the center. I need to put it in a smaller pot. I REALLY want this breaad to work out for us… so easy and the flavor is delicious! Can you clarify what less gluten, more protein means? Because I thought higher-protein flours were better for breads, etc, because they produced more gluten? Sarah – thanks for catching that. I meant to write more protein, thus more gluten. One thing I’m sure we disagree on is the age of this Earth. I’m a believer in creation. I believe God created the world around 4,000 years ago. It was interesting to read from this book how during the time of the early Israelites, Greeks, and Romans, bread was mostly made of wheat and barley. Other grains were also included but in less amounts. During those times the grains were freshly milled, and then refined by literally tossing the flour on sheets and separating as much of the bran as they could. It was then made with fermented yeast. Sourdough. This process took quite a few hours from flour to bread. Since then, as most of our industrialized system has gone to, we’ve hybridized to create more wheat, quicker, for less money. We now produce wheat to accomodate breads that can rise quickly. Therefore the grains were hybridized with more protein. More protein equals more gluten for a quicker rise. On top of the heavy gluten in it, most commercial flours add more gluten to the final product. So it has a whole lot more than what wheat originally did. On top of that, wheat has been hybridized to grow on shorter stalks. This helps aid heavier yields. But, because the stalks are shorter, they need more pesticides since they’re lower to the ground. Lastly, since they are producing more, they are taking way more nutrients out of the soil, so thus in need of more fertilizer. As you can see, this is not what God intended. I hope I cleared things up. Thanks again for pointing that out! I’m curious as to how you arrive at the age of the earth being 4000 years? Most young earth creationists I have met believe that the earth is 6000-10000 years old. Regardless, you make several claims above such as “most commercial flours add more gluten” – I’d like to see some statistics on that. And regardless of what you believe as the age of the earth, there is significant research that has been conducted on how man has cultivated both wheat and maize from the native grasses of the region into the products we use today. It didn’t get there overnight and it certainly took longer than a few hundred years with ancient crop breeding techniques. I do think you write an excellent blog on recipes and cooking, but if you are going to write about the history of agriculture, I would personally appreciate a more in-depth look at the cultivation of food crops rather than one source with no citations from scientific literature on the subject. Also I’m curious if you’re familiar with famous Iowan Norman Borlaug? Millions of people were saved from starvation with the intensive farming techniques that you find so repulsive. I’m not saying that all modern agriculture is good, but it’s impossible to feed all of the people on this earth with non-hybrid crops and old farming techniques. I’m glad you are able to feed your family this way, but not everyone is so lucky. As someone who is adamantly pro-life, I would think you would have some thoughts on individuals who are trying to solve the problems of world hunger rather than incorrectly writing about the origins of modern farming techniques and making blanket statements about the viability and sustainability of such techniques. I know this is your blog, but the comment section exists for having a dialogue with your readers regarding the things you write here. Sarah – This is what happens when I type with 2 toddlers playing and a crying baby wanting some milk. 4,000 years B.C and 2,000 + A.D. So yes, around 6,000. Thanks for sharing your opinion. To address a few of your questions. This post was not about the history of agriculture. It was about how to start a sourdough starter. In it, I talk a “bit” about the book, The Vintage Remedies Guide to Bread. I enjoyed reading it and it’s research. I reviewed it specifically for people like you that may also be interested in the subject of how our bread has completely changed from how it was made during ancient times. I encourage you to read the book. In it, you’ll find all sorts of research with cited sources. I think you’d enjoy that. As far as stating that I find intensive farming techniques repulsive. Well, that’s just not fair. I didn’t say that at all. There are many great intensive farming techniques that grow using methods that are sustainable to our land. I’m not a proponent to industrial growing techniques. Ones that deplete the nutrients in our soil, cause pollution by air and water, deteriorating the environment around us. I don’t believe that these intensive farming techniques are feeding our world at all. Why are there so many hungry people not just in third world countries around us but even within our own. I can definitely go on, with this subject, but that’s not the nature of this post at all. Another thing Sarah – I’m not an opponent to hybridized seeds. Goodness, I use quite a few in my own gardens. I am however, against GMO and it’s unfortunate that wheat is headed that way. I am happy to see you understand the dangers of hybridization. Wheat was crossed with a dwarf Japanese grass. When that was done it did make “wheat” grow on shorter stalks, but the problem is that the “wheat” never fully matures, it just looks like it does. Because of the ripening before maturity, the chains of amino acids do not fully develop and so it makes the proteins toxic to our bodies. The problem is not that there is more or less protein, but that what is present in hybrid – genetically modified wheat – is not compatible with the digestive system of either man or beast! I’m hearing a lot about einkorn wheat lately as an ancient grain that has a lot less gluten and protein. I haven’t tried it though. So what is the diference between sough dough and just using yeast, and saving some of the dough to make bread in the future? Isn’t it the same thing? Can you tell me if this is a real sour bread. I have read the book and tried to catch my own yeast but I was ending up throwing away so much flour I just couldn’t justify keeping going. I did have minimal success but the bread was so sour my family hated it. I’m trying to figure this out as well. to not waste, yet, managing the baking in my schedule. The first week, I do feel it’s important to toss the excess. For the following two weeks, I like to save it to make crackers or pancakes. Now that my starter is active, I’ve been baking with it twice a week, and storing it in the refrigerator until I’m ready to use it again. Keeping it in the fridge is allowing me to not waste. My bread was not that sour. However, the day before I bake, I feed it twice. The longer that the starter is allowed to sit and ferment, the more sour it becomes. So, if you feed it two times during the day, it won’t be as sour. I’m by no means a professional and I’m just starting to get back into this. So, as I do and I figure more of this out, I’ll share my findings and the easiest way to manage this in your schedule. I get the thing about the way our bread even our grains are grown today, but when you put filter water Into recipe, I know they did not have filter water back in those days so I believe well water is what they used and would be best!! Just saying! I started my starter 3 days ago. It appears that it’s already taken, because it is filled up my pint jar already. do I need to go up to the larger jar now, or should I wait the full 2 weeks? Hi Christi, from what I have learned from the GNOWFGLINS sourdough e-course, although it may rise right away, it’s still not strong enough. I would personally start using it for things like pancakes, crackers and things like that. However, for a loaf of bread, I would give it a good two weeks to make sure the yeast is strong enough to rise dough. Thanks for this post Diana. I have just started my starter and have fingers crossed. I am on a quest to help my family eat the way I believe God intended. It has been a long search and I am so glad to have come across your site. It is all a bit overwhelming and so I am taking it one step at a time here in sunny South Africa. Hi Diana , ok I have a question about the sourdough . Where do you store it after it’s “ready” to bake with it? and would I have to feed it infinitely ? Finally found a sourdough starter that sounds doable. I am starting this today and will be videoing the process and progress and sharing it (with full credit to your recipe, of course) on my YouTube channel in the weeks to come. Can’t wait!